The Gentleman Crafter: Inspiration Emporium August Challenge-Done! Hope everyone's week is starting off to a good start! So far this week has been really GREAT and busy, which I like! OK ENOUGH! Time to get serious...On with today's blog post...Let's Go Fly A Kite Up to the....STOP! STOP! STOP! I marked a line with a pen and ruler to about a third of the round chipboard box. I then cut on the line with my craft knife. Next, I measured the bottom of the box and cut a piece of chipboard to match and adhered it to the bottom. of the box. I then laid the semi-curcular box down flat and traced around the shape on chipboard. I cut the piece out and adhered it to the back. With that done, I punched the grass from the Crowded Attic paper collection and added Scor-tape to the back of the strips and layered them on starting at the top and worked downwards. I cut the Umbrella Man from the die three times from chipboard. I nipped off the umbrella on all three. I glued two of the cuts together with Glossy Accents and then made a small channel for the "kite wires" on his hand and arm. Last, I glued the third piece to the others. I inked the Umbrella man and the umbrellas with the archival Ink and heat embossed them with black embossing powder. Last, I embossed them with UTEE. 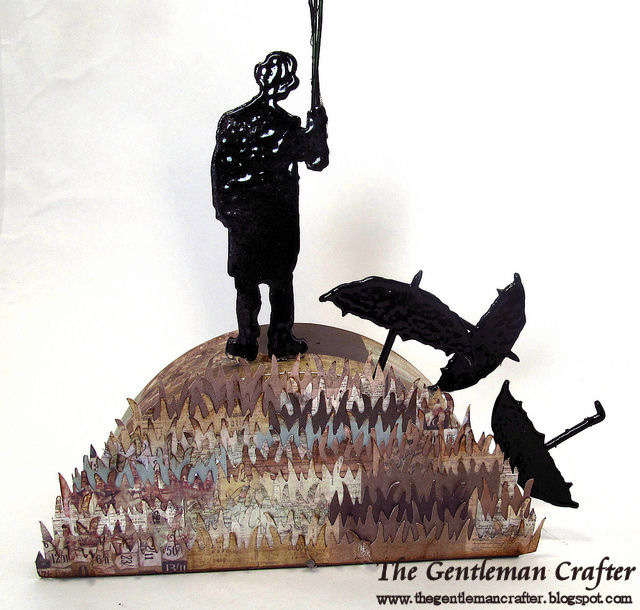 I glued the umbrellas and Umbrella Man to the top of the domed box. I took some heavy gauge wire and wrapped it around three of the Hinge Clips and synched down with needle nose pliers. Last, I bent the wires a bit and glued the wires into the channel I made in the chipboard hand. I cut three tags with the Sizzix Movers & Shapers Die - Tag & Tie from the Destinations Paper collection. I cut the letters for the tags from the Vintage Market die I adhered the letters to the tags and stamped the wings and the letters onto the tags. Last, I inked the three Trimmings with Victorian Velvet, Peeled Paint and Broken China and put them through the tags holes and then clipped the tags to the hinge clips. That's it! Done! Hope You Like It! Thanks for coming over to visit! I love these 3D things you do. This is cute cute cute. Might have to break down and buy this little man (if I don't have him already). Ready for another trip to Archivers? I finished the baseboards! This is just amazing!!! I love how it follows the theme and it so very dimensional!!! That looks so awesome! Thank you for sharing! I really like the kites, what a cute idea. love it Sir Jim has a whimiscal look that links to the film, way to go pal. Hi Jim, I have seriously been considering investing in a chipboard trimmer after watching your three amazing videos showing how you work step by step from start to finish. The only problem is I would still be limited to straight line designs. I no longer have the strength in my wrists to cut through chipboard (I struggle with card) or the control to be safe around an open blade. Last year I was looking into an electronic cutter to do this but they either didn't go through chipboard (like my silhouette) limited you to design cartridges or users on the forums were saying the software was hard to use. Any ideas would be really appreciated. This is so cool Jim! I love the Umbrella Man's umbrella's on the ground! Brilliant. AWESOME!!! Your creativity never ceases to amaze me. Thank you for sharing it! Awesome project! I don't think I've seen anything like it before. I love this Jim - so quirky and different! Grrrrrrr - I've got that song in my head now too! Oh no...gonna be singing that song ALL day! What a great piece! Must be scary in that brain of yours....but so much fun!!!! Thanks for sharing this fun piece! 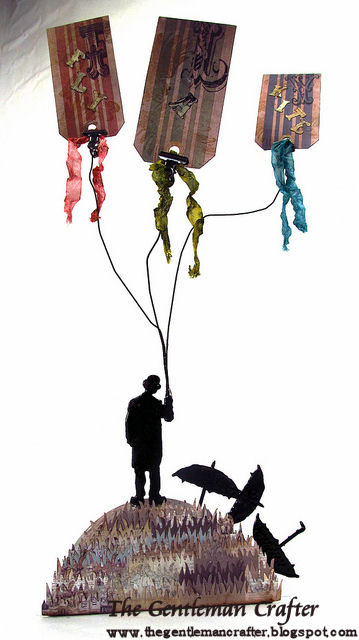 So much to love here...the tumbling umbrellas, the wonderful box kites....the stark silhouette of the umbrella man...who knew you could do sculpture? Oh you crazy, wonderful, creative man! Love this piece! You always take things we look at all the time and flip them in a totally new way. Awesome! Jim, This project is Over The Top!!!! You have got quite the imagination. AWESOME!!! Clever!!!!! Has Sir Tim seen this yet???? He is going to flip over this one. Great minds think a like...I had already printed off the words to that song (from Mary Poppins) and had my umbrella man stamped. Hmmm...will see if I can't take this in another direction. Nicely done 3-d piece! This is to die for! I'm not much of a tag maker...but this is a great way to display them...and what a fun idea for party decorations. You have to be the winner!!!!!!!!!! Oh and thank you so very much for getting that song now stuck in my head! Well, you've done it again!! Awesome work! super cute! love it! and thanks for the song....ugh! LOL! I just found you today. A friend of mine mentioned your great work. I love your piece! The 3D aspect of it is so cool. The kites out of tags is just so creative. Glad I found you and am now following you. Can't wait to learn how to alter stuff. I mainly do cards now..
LOVE IT!!! I love everything about the Umbrella Man's kites...the grassy hill, the umbrellas on the ground, the man himself flying his kites...super project!! But I would expect nothing less!!! Oh and thanks for planting that song in my head...NOT...LOL!! OMG!!! Have you been watching Mary Poppins??? I just bought it and Chitty Chitty Bang Bang for my niece. Love the song, so won't mind it being stuck in my head!!! I love this 3-D project. The Umnrella Man is perfect for this!!! 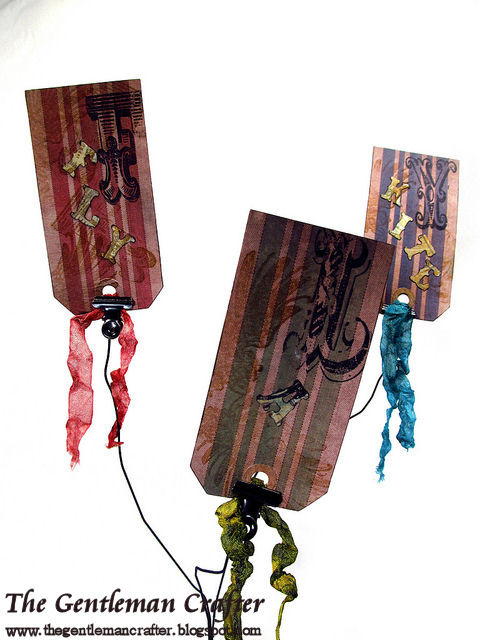 What a great twist on kites!This one is magical. Does want to make you sing that song. If you ever get a chance, could you do a little video on how to use wires? I'm never quite sure how to get on with them. Hope the rest of your week i great. Jim - super cool! Your mind, combined with your talent.......Priceless! Gentle Jim-- You continue to be beyond amazing. Hugs. JIM !!! OMG ... now that is so COOL ( no actually beyond cool ... LOL )... you WOW me !! !